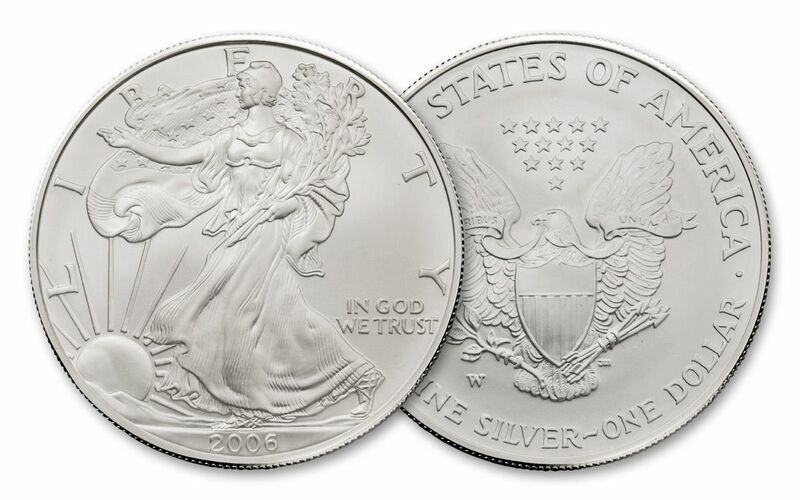 The Silver Eagle is arguably the most collected silver coin in the world. Several varieties of this coin exist, but none come in smaller mintages than the Burnished Silver Eagle, minted with a satin-like finish that sets it apart from the more populous bullion and Proof Silver Eagles. In 2015, for example, nearly 224,000 Burnished Silver Eagles were struck. If that seems like a lot, consider that same year’s mintage of bullion Silver Eagles: 47 million! That’s a mintage of Burnished Eagles that’s nearly 210 times smaller than its bullion counterpart – that’s less than half of 1 percent! And unlike other versions of the coin, the Burnished Silver Eagle has not been struck every year. In fact, only 11 different dates of Burnished Silver Eagle exist! But thanks to our dedicated team, you can now secure all 11 dates in one complete collection (this set does not include 2011-S Burnished Silver Eagle that was struck exclusively for the 25th Anniversary Silver Eagle set). This is truly the ultimate Burnished Silver Eagle collection. Not only is every coin graded by the Numismatic Guaranty Corporation (NGC) as being in perfect Mint State-70 (MS70) condition – a distinction that means your perfectly-graded coins will have ZERO imperfections – but each coin comes sealed with a label personally hand-signed by John Mercanti, 12th Chief Engraver of the U.S. Mint and the very person who designed the Silver Eagle reverse. Don’t wait for our limited supply to run out – secure a full set of perfect-grade, Mercanti-signed Burnished Silver Eagles today! WEINMAN'S CLASSIC WALKING LIBERTY . 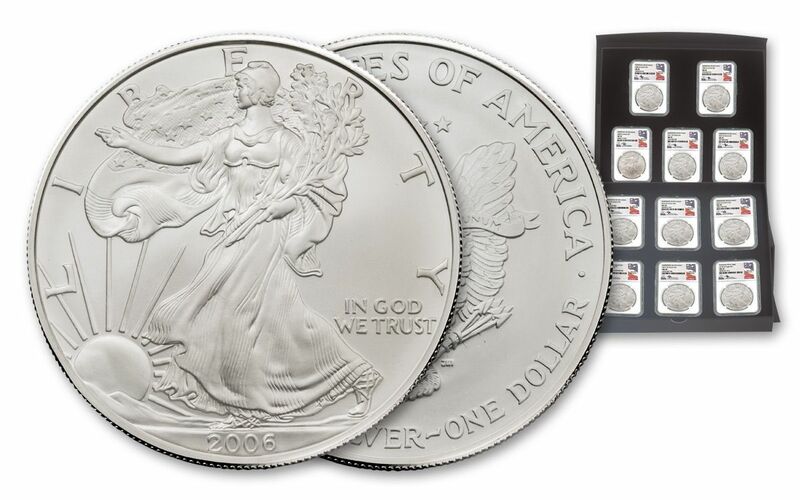 . . – Adolph A. Weinman's iconic Walking Liberty design first made its debut on the 1916 half dollar, lasting three decades before bowing out in 1947. In 1986, this iconic image was reborn for the Silver Eagle with her exquisitely detailed beauty remaining on the coin ever since.
. . . PAIRED WITH JOHN MERCANTI'S HERALDIC EAGLE! – This stoic and symbolic heraldic eagle featured on these coins was created by designer John Mercanti – the most prolific coin and medal designer in United States Mint history! EXPERTLY STRUCK IN HIGHLY PURE SILVER – Each Burnished Silver Eagle is created from specially prepared 99.9% silver blanks that give each coin a distinctive smooth, matte-like surface, as well as razor-sharp details and blazing luster. U.S. LEGAL TENDER – Minted in silver mined in the United States with weight and content guaranteed by the U.S. government, each One-Ounce Silver Eagle is $1 U.S. legal tender, as seen on the coin’s reverse. 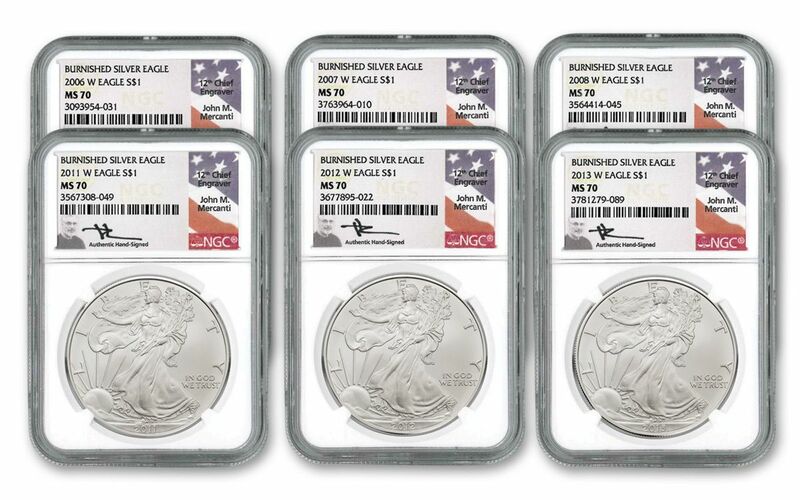 GRADED IN PERFECT UNCIRCULATED CONDITION – Your Burnished Silver American Eagles will come graded by the Numismatic Guaranty Corporation (NGC) as being in perfect Mint-State-70 (MS70) condition, a distinction that means your perfectly-graded coins will have ZERO imperfections – showing all features and fields exactly as the engraver and mint intended! AN AUTOGRAPHED LABEL! 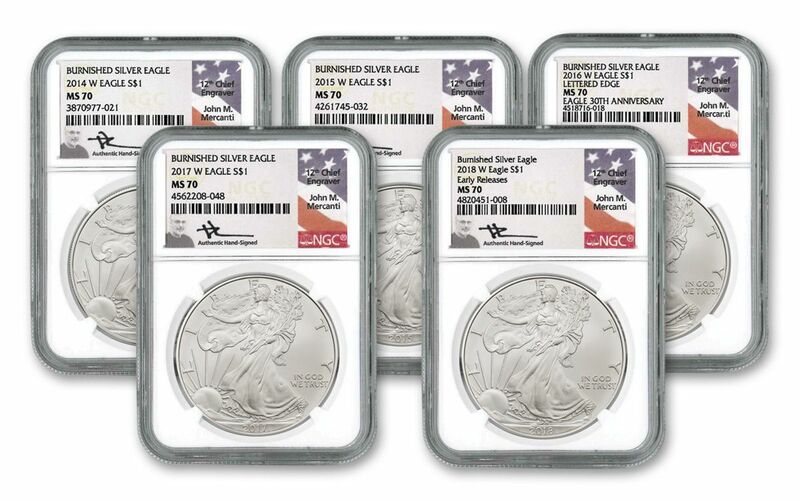 – The labels encapsulated with your Burnished Silver Eagles display another phenomenal feature – the autograph of John Mercanti, the 12th Chief Engraver of the U.S. Mint! Each year’s Burnished Eagles represent only a small portion of American Silver Eagle coins struck by the U.S. Mint – and an even smaller amount are ever signed by John Mercanti! Now you can get a complete 11-coin set of Burnished Silver Eagles all signed by Mercanti. Just click it to your cart!